A few days ago I mentioned that Dave Lovewell, who passed away last November, wasn’t nearly finished contributing to the Lovewell History website, and after the latest email from a Stofer descendant, I knew the time had come to put his shared memories back to work. One of Dave’s great advantages in family history was a personal connection to a more distant past. He spent some of his earliest years being raised on a farm owned by Thomas Lovewell’s son Stephen and Stephen’s second wife Alta (Mann). He recalled that surrounding Stephen and Alta’s yard was a fence with an interesting story attached to it. Alta told him it was built to keep Orel Jane from running away. After Thomas’s widow came to live with Stephen and Alta in her final years, she would scurry off from time to time, apparently trying to make it back to her old house, the last place she remembered being content and independent. Who knows - perhaps she hoped to find Thomas living there, sitting on the porch in his rocking chair waiting to greet her. Before they fenced the yard, Alta had to go trotting after her mother-in-law, taking along an item that would make carting her home somewhat easier. Ashley Gresham has supplied a few pictures of Orel Jane of late. 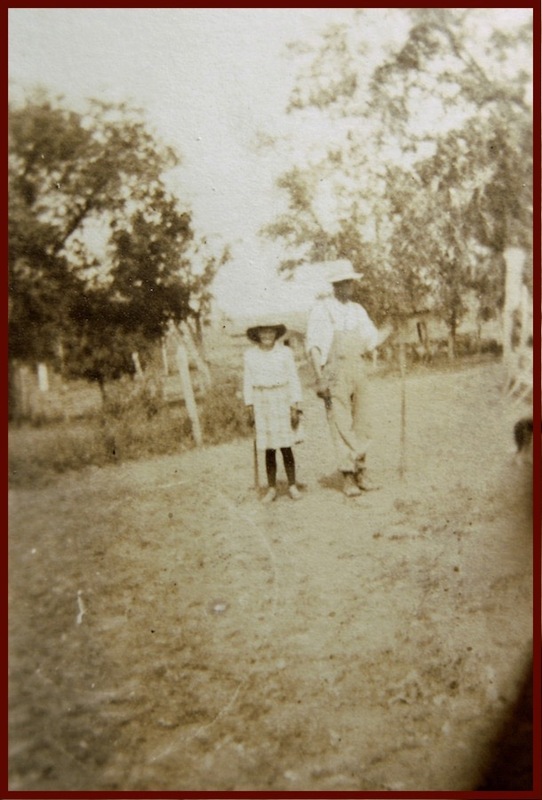 I speculated that an early one of Thomas and Orel posing in their yard in the early 1900’s (“The Straight Truth”) was an indication that Ben and Mary Stofer had invested in one of Kodak’s new Brownies, which hit the market at the start of the 20th century. After brushing up on my Brownie lore, I realized that I’ve been slightly off-target in my explanation of the popular early-day box camera. The rectangular image displayed here would have been produced by the No. 2 Brownie, a model introduced in 1901. I wondered whether it was Ben or Mary who had trouble holding the camera level while pressing the shutter, making it seem that everyone was standing on a steep hillside. Now I know. Turns out, it must have been Mary. And Orel Jane really was tiny, made to seem even more diminutive in the picture to the left, by walking down the path next to the towering figure of her son-in-law, Benjamin James Stofer. 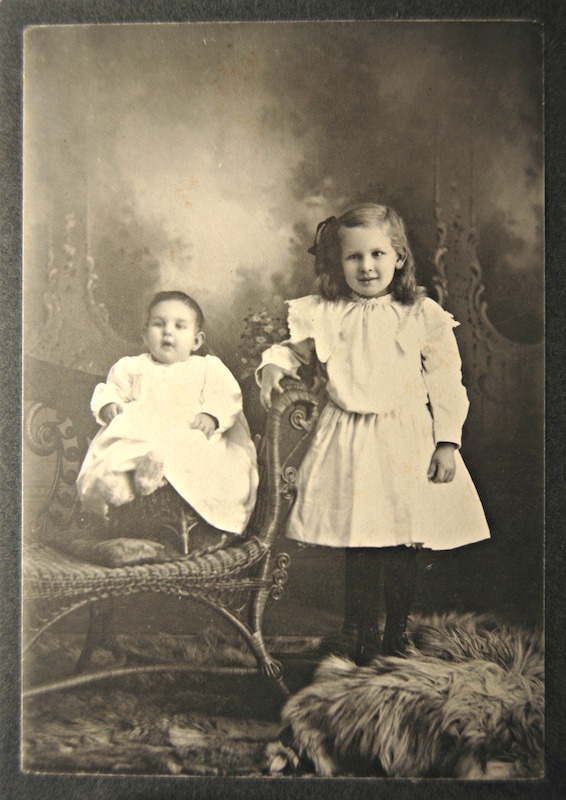 The camera was evidently purchased a few years following the couple’s run of bad luck with their babies at the tail end of the 1800’s, and may have been used to preserve the outdoor antics of young Ethyle Dolores* Stofer, born in 1901 (or 1902), who was joined in 1904 by baby brother Benjamin Thomas Stofer. The fuzzy images produced by a Brownie in unsteady hands were no match for a professional portrait by a studio photographer - although, without those Brownies, think of the pictures we wouldn’t have. The 3 ½ by 2 ½ images came eight to a roll, so there’s no telling what’s still out there waiting to tumble out of a closet or fall from between the leaves of a book. 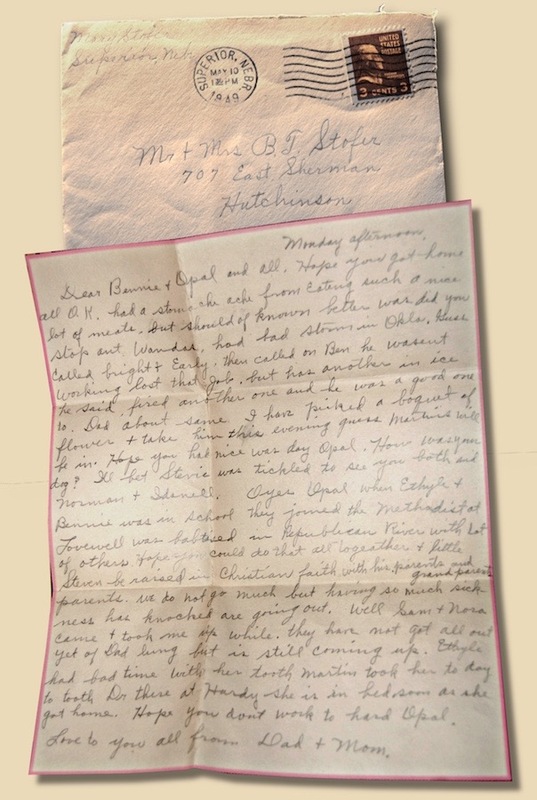 As if responding to my earlier lament that families don’t tend to save letters, Ashley also shared a note written by Mary (Lovewell) Stofer to her son Bennie and wife Opal in Hutchinson. This one only seems like an historic artifact if you’re fairly young, since it was mailed in 1949, but it is a genuine letter from Thomas Lovewell’s daughter, born at White Rock in 1880, and educated at White Rock and Lovewell schools. Speaking of education, a look at the 1940 census tells us that Mary completed the 8th grade, about average among rural Kansans of her age. A number of her younger Courtland neighbors on the same census page indicated that they had four years of high school under their belts, and there were even a few with four years of college on their resumés. A 44-year-old neighbor named Andrew Engwall, who owned an automotive garage in Courtland, proudly claimed four years of high school, while his 38-year-old wife Nina, who kept house, could dust her college diploma. Ben Stofer seemed to do well enough in his real estate business after completing five years of grade school at Lovewell. What did Mary have to say? It’s a sweet letter, most of it spent catching up the kids on family matters, nagging about the sort of things moms tend to nag about, reminding them to have their little ones baptized and raised in the family faith, although she also confesses that she and Ben don't attend church that much anymore, because of frequent sickness. There are a few colloquially variant spellings, extra words, disagreements between subject and verb - you know, the sort of things you’re already used to seeing on this site all the time. So, Mary's letter fits in quite nicely here.